Catrine De mew Scaris is a great artist. She loves her native city and to draw. Catrine is wearing a white fur and beautiful purple hair with pink streaks to her shoulders. Externally, she is very similar to a cat by her eyes and habits. In addition she has a tail, beautiful blue cat eyes and a lovely mole under her left eye. Pick a nice outfit for this beauty in this dressing up game. To do this, use the mouse in the game. Push the button to open sections with hairstyles, jewelry, dresses and shoes. Think of a new image of the cat!? Played: 43209. Added: 29-07-2013, 22:26. 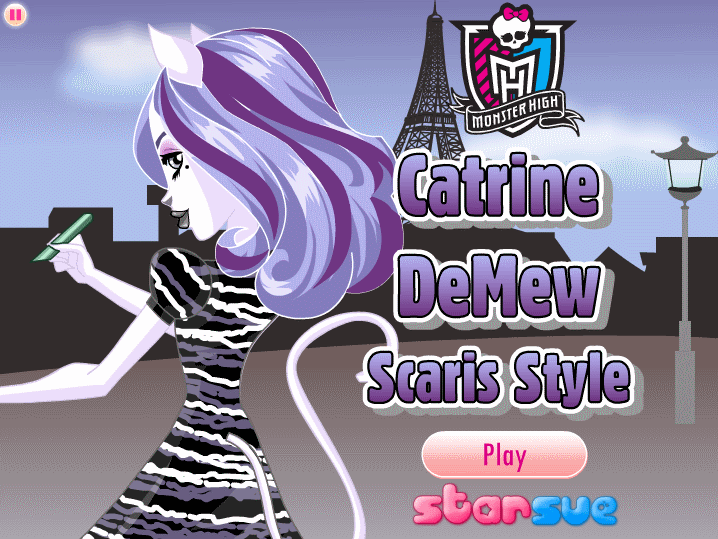 Catrine DeMew dress up game.